Newtown’s unlikeliest craft beer haven is a model of bottling efficiency. About two years ago, recognizing the growth of craft beer in the area, owner Bob Slattery (who also co-owns nearby Fifty West Brewing Co.) transformed the Shell gas station on Church Street into The Growler Stop, replete with 22 taps—most flowing with local brews—and 64- and 32-ounce growler bottles. 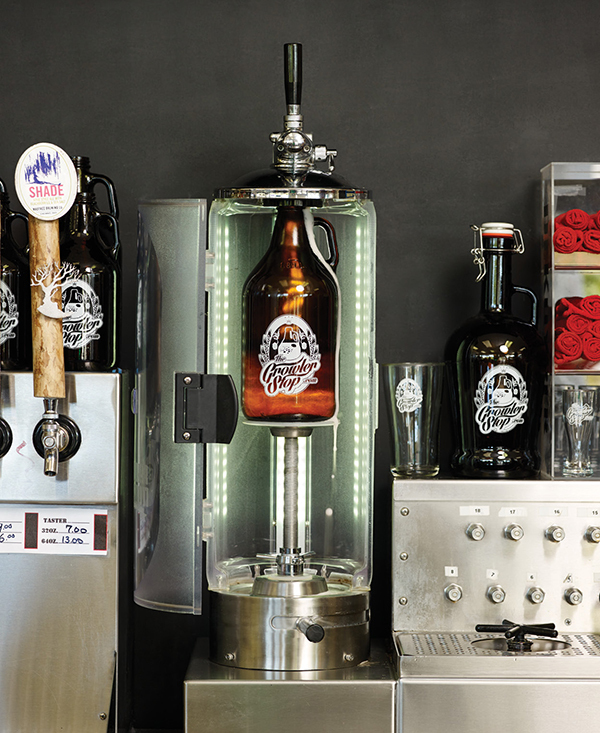 They fill growlers using the Pegas CrafTap system, a counter-pressure device that functions like a standard beer-bottling machine. The Pegas creates a vacuum in the growler, removing all oxygen from the filling process, and then blasts the bottle with carbon dioxide once it’s full. “Whenever beer comes into contact with oxygen, that’s bad,” says manager Dale Richter. Most places fill growlers using a tube that runs to the bottom of the bottle. This helps to minimize foam (or “head”), but doesn’t eliminate the oxygen. With the Pegas, the standard 2 to 3 inches of foam filling the neck of the bottle creates a vapor lock for the beer below, ensuring that oxygen stays out.